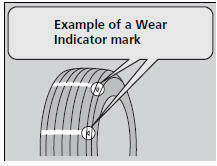 The groove where the wear indicator is located is 1/16 inch (1.6 mm) shallower than elsewhere on the tire. If the tread has worn so that the indicator is exposed, replace the tire. Worn out tires have poor traction on wet roads.